The medical marijuana landscape continues to change. Arkansas has come on board and is one of 29 States in the United States of America with a medical marijuana program. 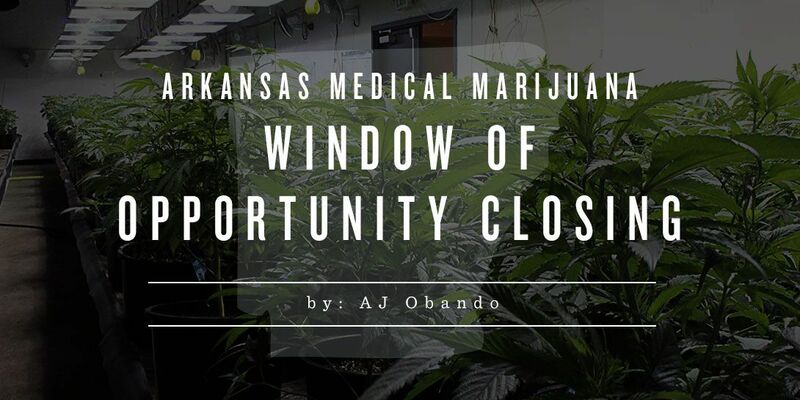 With that, the window for medical marijuana cultivation license and medical marijuana dispensary license applications has swung wide open, and is already closing! The Arkansas Medical Marijuana Commission was slated to begin accepting application July 1, 2017. The time limit to get an application in their hands has been limited to only 90 days. This gives all hopeful applicants until September 28, 2017, to get a completed application submitted. To apply for a medical marijuana cultivation license, hopeful applicants must pay a $15,000 application fee to the state when submitting their application. The commission is expected to issue only 5 licenses and those 5 applicants will then pay an additional $100,000 fee to receive their license. It's been talked about leaving the option for 3 more additional cultivation licenses available for future issue, but no official word has been confirmed as of yet. With so few medical marijuana cultivation licenses available, it is sure to be a competitive market. The fees for an Arkansas medical marijuana dispensary license application are only $7,500. While it's a financially easier pill to swallow, the distribution model that the state has outline will only allow for up to 32 dispensaries at this time. Those 32 will be separated into 8 geographic regions in the State of Arkansas to try and ensure equal product availability to medical marijuana patients throughout the state. Once again, with such a low cost of entry, competition for those 32 licenses is expected to be heavy. There is not official estimate at the number of medical marijuana card applicants are expected to sign up at roll out, but in past market expansions, the numbers were quite high. Whether you are applying for a medical marijuana cultivation or dispensary license, Strainwise® Consulting is here to help. With years of experience in the industry, we are here to help you from the initial application, through build out, marketing, launch and even through operations. The clock is already ticking in Arkansas and a winning application needs as much time to create as possible, so don't hesitate, contact us today!